Refills the energy of the Kong's musical instruments. 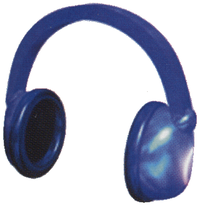 Candy's Headphones, or simply Headphones, are objects from the game Donkey Kong 64. If a Kong touches them, the energy for his or her instrument will be fully replenished. The headphones provide unlimited energy and are never used up. After any Kong learns his or her musical attack, headphones start appearing. They are often found in areas with Music Pads. These are useful without the need to go into Candy's Music Shop. They are found in every level, except for Jungle Japes and Hideout Helm. Fungi Forest is the only level the headphones appear in where Candy's Music Shop is not present. ↑ Donkey Kong 64 instruction booklet, page 26. ↑ The Donkey Kong 64 Player's Guide, page 15. This page was last edited on November 26, 2018, at 18:55.